1. Where should I place the outdoor sensor for best performance? 2. Can I use an indoor-outdoor thermometer in an apartment or rental unit? 3. What is the use of an outdoor thermometer? 4. How is thermometer used to measure the temperature? 5. Do indoor outdoor thermometers have extra features? Having an idea about the temperature within your house is good because it lets you know how to adjust your air conditioner or warmer to make you and your family comfortable. However, having an idea of the temperature outside your house is perfect because you will have excellent knowledge of how to dress when going out. In addition, you can effectively plan your day if you know how the weather will be that day. The best indoor outdoor thermometer utilizes a sensor kept outside a home to wirelessly send climatic information to an indoor monitor. Thus, you can easily get data on current wind speed, humidity, temperature as well as many other interesting weather-related components. However, with the advent of Smartphone, people keep track of temperature with weather apps. While the Smartphone is a convenient device, its temperature readings are not that accurate. The indoor-outdoor thermometer is the best device to give you accurate information about the temperature outside and inside. There are several types of indoor-outdoor thermometers in the market today and choosing the best can be a daunting task. The aim of this indoor outdoor thermometer reviews is to give you in depth knowledge of the best models of indoor outdoor thermometers available today and how you can choose when you want to buy one. Even though The La Crosse Technology Digital Thermometer is smaller compared to others on this list, it still possesses sufficient power and size to be one of the top indoor outdoor thermometer you can find anywhere. This is because it displays extra large digits, which makes it easier for you to view. It comes with a wireless remote and a clock, allowing you to effectively control the device even from some distance away. Furthermore, it is equipped with three sensors which can be utilized simultaneously to obtain information for you. With the ability to obtain weather data within a distance of 330 feet (without any obstruction), you don’t have to worry about where to keep the sensor and the device for better reception. However, to get the best readings, it is advisable that you avoid obstructions like glass, metal, trees or concrete as this may reduce signal range. Also, it gives you an update every 4 seconds, meaning that you will not miss even the slightest change in weather conditions outside and inside. It is recommended that you place the outdoor sensor facing the North, well protected from precipitation. To ensure that water drains from the casing, place the sensor vertically; even though the transmitting sensor is weather proof, it is not water-resistant. Furthermore, the information is displayed in such a way that you don’t confuse any of the parameters: the two temperature displays are properly designated to allow you differentiate which one is indoor and which is outdoor. For the clock display, you can choose 12 or 24 hour clock, while the temperature has either Fahrenheit or Celsius display. The La Crosse thermometer uses AA batteries, making it simple to use and change whenever you choose to. However, it is better to use Lithium batteries rather than alkaline batteries, especially if you are living in very cold areas. Another unique feature fo this thermometer is that it can be tilted up, thereby making it easier for you to read the displayed information from afar. This excellent outdoor indoor thermometer is made by the World renowned brand- AcuRite. As a matter of fact, it is one of the best weather thermometers. Its standout feature is its humidity sensor, which delivers accurate humidity percentages for you. This allows you to prevent allergies that results from the growth of viruses, fungi, mold, bacteria and mites. The AcuRite 00611A3 comes with an outdoor remote sensor which is made with highest quality wireless technology. It is also weather-proof, meaning that you do not need to worry about it climatic elements spoiling it. Furthermore, its display is rather large, making it easy to read and providing the information you need devoid of toggling. Its temperature arrow will inform you when the weather is becoming colder or hotter by pointing downward or upward, allowing you keep in touch of weather trends. Also, it can receive weather data from a distance of 165 feet, a fair distance for a budget thermometer. Also, it gives you an update every 30 seconds, meaning that you will not miss any changes in weather conditions outside and inside. It is a flexible gadget, allowing you to pick either Fahrenheit or Celsius readings. This AcuRite is among the best wireless thermometer available today and you will love the smart design and solid construction. Also, it is produced from top quality materials, which means that you are sure of getting temperature and humidity updates for years to come. Even though the thermometer is large, its construction is lightweight, making it easy to travel with it anywhere you are going to. Furthermore, it is designed in such a way that it can either be placed on a tabletop or hanged on the wall. The Ambient Weather WS-10 is a simple, cool and simple to use thermometer, which delivers accurate temperature and humidity data. One feature that makes it one of the best rated indoor outdoor thermometer is its console which possesses indoor thermo-hygrometer sensors. It also has 3 different remote sensors to measure temperature and humidity outdoors. However, the beauty of this unit is that all the readings from these three remote sensors can be displayed simultaneously. Also, it comes with audible and visual notifications that will alert you whenever the indoor or outdoor temperature and humidity is more than the highest and lowest limits you set for the unit. Hence, it will tell you when the temperature or humidity outside or inside is more than what you set as comfortable limits; this allows you to adjust the air conditioner accordingly or alter your dressings for the office. Another excellent feature of the WS-10 is that you can connect its console remotely to at least 8 remote sensors at a time. Thus, you can monitor the temperature and humidity of eight different rooms or locations within and outside your house with just one unit! Also, when it is in a scroll mode, you can see the indoor temperature and humidity in 4 to 8 channels without touching any button. Furthermore, it updates the indoor and outdoor temperature and humidity after every 60 seconds; this means that you will not miss even the slightest change in temperature and humidity all day along. With the ability to obtain weather data within a distance of 300 feet (without any obstruction), you don’t have to worry about where to keep the sensor and the device for better reception. However, to get the best readings, it is advisable that you avoid obstructions like glass, metal, trees or concrete as this may reduce signal range. As a matter of fact, the WS-10 is among the most versatile indoor outdoor thermometer available in the competition. 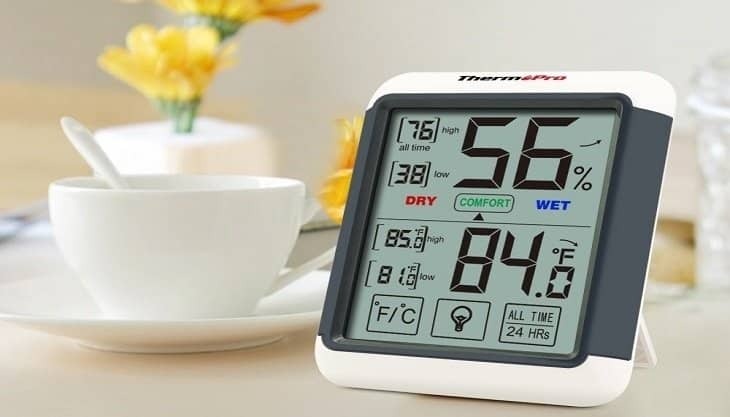 If you want to purchase one of the best outdoor wireless thermometer that has fewer complicated components and at an affordable price, the ThermoPro TP 65 is for you. Apart from its straightforward design, you will appreciate its large and bold display as well as accurate temperature and humidity readings which allow you to read data from far distances. This enables you to make appropriate adjustments to your dressing when going outside and within the home. Its display also has a top quality user friendly backlight in case you want to check the temperature and humidity readings at night. For convenience, the backlight goes off after 15 seconds. With its sleek touch screen, you no longer have to remove the unit from the wall before you can switch its settings. Also, it’s all day high/low record of temperature and humidity means you will never miss information about the current conditions in your home and outside. Unlike other similar units which do not display battery level, the ThermoPro TP65 has a battery indicator that tells you when the battery is low. Furthermore, this thermometer can receive temperature and humidity data from at least 3 remote sensors simultaneously. Depending on the type of interference, this unit has a transmission range of approximately 200 feet and transmission frequency of 433MHz. To get the best temperature readings, do not hang the remote sensor under direct sunlight. If not, the sensor will get heated up, resulting in higher temperature data than what it should be. This will mislead you into thinking that the weather is hot outside when in fact it’s normal. Also, prevent rain from getting inside the sensor by placing it upside down. It is also recommended that if you are living in very cold areas, use nickel cadmium or lithium batteries instead of alkaline ones. If you want to go out with confidence, knowing that you already know how the outdoor temperature will be, then go for the AcuRite 00782A2 thermometer. It is one of the best wifi thermometer with remote temperature monitor. For all its accuracy and sleek but sturdy design, it comes at a very cheap price. As a matter of fact, it is one of the cheapest indoor outdoor thermometers available on the market today. Its only downside is that it displays temperature in Fahrenheit only; however for its price it is very handy. The wireless sensor makes it possible for the unit to be kept indoors to check for updates or monitor the temperature of different rooms within the house. This unit is fitted with a precision thermositor sensor to read temperatures outside up to as low as -40 degrees Celsius. Furthermore, to ensure that it keeps you abreast of temperature changes within and outside the house frequently, it provides updates every 60 seconds. Also, depending on the interference, it can receive signals from at least 100 feet. You can place it on different surfaces: either on a table top, thanks to its fold-out stand or mount it on a wall. Its display is easy to read because they are large. If you are looking to buy an indoor outdoor thermometer that will provide you accurate updates of temperature, then you should consider the Taylor 1730. As one of the best wireless thermometers, you will find that you made a great choice. With its sensor which is positioned outside the house, it keeps accurate track of both indoor and outdoor temperature. The sensor has the ability to receive transmission from approximately 200 feet and this means that you can keep the device anywhere you want to within this range and still get good transmission. It comes with the option of either Fahrenheit or Celsius so you can easily understand the temperature readings. Also, this indoor outdoor thermometer has buttons that enable you to check the high and low temperature data for your home and outside thereby enabling you to have a good knowledge of how the temperature will be throughout the day. This unit will also ensure that you can easily read off the data it generates because the digits are quite large. If you live in a very cold region, it is recommended that you make use of lithium batteries because it can provide outdoor temperature ranging from -40 to 140F. However, lithium and alkaline batteries can be used indoors for accurate readings. For extra convenience, the unit has an in-built clock. With its fold-up stand, you can conveniently place this thermometer on a table top, especially those that do not have much space. It can be tough to choose an excellent outdoor thermometer. However, worry no more, because we have found one of the best wireless outdoor thermometer for you. It has a very sturdy construction, with a metallic mount and a rubber seal that covers the on/off switch. Also, this thermometer is weather proof, meaning that you do not have to worry about climatic elements causing havoc to your precious device when you place it outside. Furthermore, it is very easy to read its display from far away because the numbers are ¾ inch large. The only downside to this device is that it only displays the temperature readings in Fahrenheit. Also, this device is very versatile; it can be used as a window thermometer, freezer thermometer and refrigerator thermometer. This means that you can use it to store your food safely while also reducing energy consumption. All you need to do is fix its suction cup on a smooth surface anywhere on the refrigerator that will allow you see the display clearly. This AcuRite 75077A3M Wireless Weather Station is indoor outdoor thermometer is such a master class, made with the best technology to provide you with the most accurate temperature of your surroundings. In fact, it will inform you of everything you won’t find out about the weather for the day. Furthermore, even though it displays a lot of information on its screen, the screen is wide enough to allow the display to be large for easy reading. Its screen displays both indoor and outdoor temperature (including their highs and lows), day of the week, date as well as time. The figures are as large as 8 inches wide and 6 inches tall. Furthermore, it is designed with a slim built that allows it to stand upright on a desk and it can also be mounted on a wall if you wish. Its temperature is displayed either in Fahrenheit or Celsius, further showing its versatility. The clock and date in this device displays split-second precision and can also adjust for Daylight Saving Time. This is because the device utilizes a radio-regulated signal to synchronize its time with that of the National Institute of Standards and Technology (NIST) owned radio station. Therefore, as they update their time and date, so does the AcuRite 75077A3M. Another feature that makes this device one of the best outdoor thermometers is that it does not base it temperature forecast on the news. Rather, its sensors are able to generate temperature data by collecting real or organic data from your surroundings. Its sensor is able to generate accurate data for your surroundings by tracking specific weather variables such as alterations in temperature, pressure and humidity. Therefore, the temperature data that you get is specific to your surroundings. In addition to daily temperature readings, you also get high and low-temperature information. This enables you to have an idea of what the temperature will be like all day long. Amazingly, just like your local weather channel does, this device displays an image of how the weather will be like for that day; whether it is going to be sunny, cloudy or something in between. With the ability to obtain weather data within a distance of 330 feet (without any obstruction), you don’t have to worry about where to keep the sensor and the device for better reception. While having knowledge of indoor and outdoor temperature is very important, it is equally important to know the temperature of your swimming pool before you take a plunge. This is because you may not enjoy your swimming if the pool temperature is excessively hot or cold. Thus you need to get one best remote temperature monitor to keep you updated on your pool temperature. It is solar powered and floats on water. Also, its LCD display is large enough to be read with ease. The Swimline9250 also displays temperature in both Fahrenheit and Celsius. This Taylor is among the top rated indoor outdoor thermometer. Firstly, it has a classic design; designed like a wall clock. Thus, when it measures your indoor temperature, you will find it very easy to read it especially considering that the numbers are black and the pointer is red. It is the red pointer that shows the present temperature of your home. Hence, just like in a clock, you can easily read the values from a distance. Furthermore, since this thermometer is weather resistant, you can confidently mount this thermometer inside a garage or patio knowing that no climatic element can damage it. Also, it delivers temperature readings in both Fahrenheit and Celsius. A very important thing to look out for when looking to purchase an indoor-outdoor thermometer is to check the display size thoroughly. If the display is small, then it is going to be very difficult for you to read the information on the device and you may also get the wrong information. Also, with smaller displays, it will be more difficult to adequately differentiate and understand which is for the outdoor and which is indoor. Therefore, purchasing a thermometer that has a large display will enable you to easily read the temperature display and it is also possible that with a larger screen you will get other information, such as date, time, etc. Certain thermometers have a backlight, which makes it a lot easier to read your device no matter the amount of lighting in the room. With a unit that comes with the backlight, you will not have to look for a torch or turn on the lights when you want to check the temperature and in the daytime, you will not worry about things like glare and sunlight. You will be able to see the information you need and understand what you are looking at better. Additionally, you can see and understand the information wherever you are- in the dark or under bright sunlight. While certain people prefer to buy a unit that uses the battery because it can be placed anywhere in the house or office, other would rather get one that utilizes an AC adapter power source owing to the fact that it is less expensive to operate over time. However, if you are finding it difficult to pick either of them then go for a thermometer that uses both power source. Look at your needs and choose a thermometer that suits you. Your budget is a very critical factor to consider when looking to buy an indoor-outdoor thermometer. Presently, there is a wide range of options to choose from, with all of them claiming to be the best and most innovative. That is why this indoor-outdoor thermometer reviews have revealed some of the best models on the market at different prices. However, you can also carry out your own research, and will find top-quality and decked-out indoor-outdoor thermometer for excellent prices. While some thermometers on this list are higher than $30, others are lower than $30. It is always advisable to comprehensively review every feature that the indoor-outdoor thermometer you interested in buying comes with. As have been outlined previously, each thermometer has a specific design. So before you buy unit, ensure that it has all the features that you are interested in. Some of these products will come with more bells and whistles; however, this will come at the expense of more money. Take the time to evaluate what is important and what is useful. It is always better that as you are considering the type of features you will love your indoor-outdoor thermometer to have, you should also consider where you will keep the unit when you eventually buy it. You have to consider the kind of model that will fit into the space you want to display it. Go for a simple model if you intend to keep the unit in a utility room or attic but something more sophisticated if you intend to display it in the living room. It will definitely add to the beauty of your home. When you are ready to purchase a thermometer for your home or office, you will find that that there are several options. You have to make choices regarding what exactly you are looking to buy. This why you must have an idea of the types of indoor outdoor thermometers that are on the market, as well as its features, so you can make an informed choice. Certain types of thermometers come with digital numbers on their face, which makes it simple to view all the information that you require. They come with a screen and are made in a modern style. Generally, they appear finer and well made than others when they are displayed and capture people’s attention wherever they are placed. These types of thermometers are not digital, they only possess a bar which goes up and down with every change in temperature. While these types can be more difficult to read off the values than the digital models, their designs are simpler. Furthermore, analogue thermometers are cheaper than digital types and even have a longer lifespan than those with modern features. There are certain types of indoor outdoor thermometers that will allow you to obtain more information about the weather, in addition to the temperature. With these types, you can get more knowledge about the weather in general, thereby enabling you to check the forecast easily. Another feature that can be very important in an indoor outdoor thermometer is a time display. Hence, if you are looking to buy a thermometer that can also display the temperature, then a clock thermometer is the best pick for you. It will help you to get quick updates on the date and time in addition to the temperature. It can be very handy at home or in the office. The main aim of getting an indoor outdoor thermometer is to obtain accurate outdoor and indoor temperature (and sometimes humidity) data which is then transmitted to the building through a sensor. Therefore, you don’t have to go outside to get a temperature reading. They are ideal for everyone who intends to have excellent knowledge of the temperature before they step outside. To ensure that it works effectively, you have to fist of all read all the instructions that come with the unit. By so doing, you will know the dos and don’ts of the unit you have bought. Even if you have had an indoor outdoor thermometer before, it is always advisable to go through the manual of a new unit because their instructions might not be the same. To allow for efficient transmission of signals, do not place the thermometer in a place that has a lot of interferences as this will limit the ability of the sensor to send signals to the indoor unit. Place the remote sensor in an area that has less trees and buildings. Furthermore, if your unit is not weatherproof, you have to install it in a place that will have less contact with weather elements. It is also important to note that a weather resistant unit does not mean it is water resistant. Some models are both weather and water resistant, while others are only weather resistant. Check the manual to make sure which one yours is resistant to so you don’t mix it up. Read best infrared thermometer review. If your unit is not water resistant, follow the instruction on how to place the remote sensor outside to avoid water penetrating inside the unit as this will render it useless over time. Also, it may be giving you wrong temperature readings. Ensure that the distance between the remote sensor and the display unit is within the range recommended by the manufacturer, if not, you will not get adequate readings. Also, if you live in areas that have extremely cold temperatures, it is advisable to use lithium batteries, rather than the conventional alkaline batteries. If you want to get accurate temperature data, it is best to place the sensor at least five feet above the ground. Do not keep the sensor in a place that it will be affected by direct sunlight or heavy precipitation because this will lead to incorrect readings. Place it in the area that receives good airflow if you want to get the best measurements. Moreover, note that metals or thick walls around where you place the sensor can interfere with the signals. Of course, yes! A lot of the models available do not need in-wall wiring or drilling, so you can use one in your rented apartment or unit. In fact, several units come with a stand which allows you to keep them on a table top, while some have the option of hanging on the wall. The remote sensor can be attached to the external part of the building using an adhesive and its small size means that it won’t be easily noticed. An outdoor thermometer is used to obtain the temperature readings outside the house suing an indicator inside the building. Therefore, you do not have to step outside before you can obtain a temperature reading. It can also be used in cars as well as vehicles that carry out snow and ice clearance in cold regions. Select a location outside for your thermometer; to get accurate temperature readings, this must be a location that does not get direct sunlight and is not hidden so as to avoid getting inaccurate temperature readings. As much as possible, keep them away from metals and concrete or where rain can get inside it. Hang or install your thermometer according to the thermometer’s instructions. Some models of indoor outdoor thermometers also provide data on other weather elements apart from the temperature. You can get information on the level of humidity both within the house and outside. Certain models can measure barometric pressure and reveal the moon phase. Others display both the upcoming forecast and graphical representation of the current weather. Since there are several models of indoor-outdoor thermometers on the market today, getting the best can be a tough job. This is why this indoor-outdoor thermometer review is aimed at making this task simpler for you. First of all, you have to understand the differences between all of the options you are looking at so you will know which is best for you. While we have several reputed companies that make indoor-outdoor thermometers, you have to ensure that you buy exactly what you need. Since your objective is to get an indoor outdoor thermometer that suits your personal or business use, it is better to be sure of exactly what you need. This involves deciding on the exact features that you need before purchasing one. The 10 best indoor outdoor thermometer review section will help you choose the right thermometer. Be rest assured that any indoor-outdoor thermometer you order from the above list is excellent and you will not be disappointed.